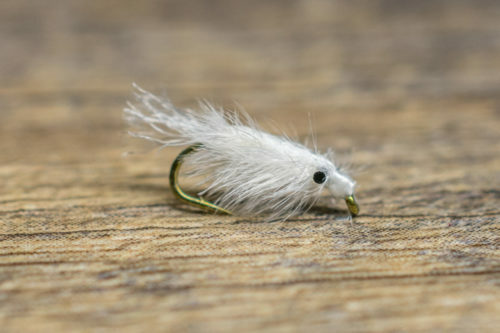 The bead head Crystal Bugger is a simple offshoot of the famous Woolly Bugger. It has an identical profile, but with a lot more flash! It is an excellent baitfish imitation, having a simplistic design without the unnecessary bulk of modern-day streamers. The brass bead head allows it to sink quickly, while the marabou, flash and saddle hackle create great action in the water. Tied for long lasting durability and performance the Meat Whistle is a must-have in your streamer arsenal! Minnows and baitfish provide trout with more bang for their buck and they rarely refuse the opportunity to eat one. In most cases, we strip a Crystal Bugger with a traditional down and across delivery. Although, we have found that a quick, short retrieve provides the best results. Whether you are swinging it, stripping it, or dead-drifting it in smaller sizes the Crystal Bugger is a must-have for your streamer collection.